Heitz Cellar Dinner at The Tasting Room. This was basically a practice session for my wife and I to take pictures and notes while dining. We're going to Chicago in June and want to have a moderate idea of what works and what doesn't to chronicle our culinary adventures. The pictures were surprisingly the easy part. Granted our first dish was poorly captured, but after I figured out that the focus needed to be manually adjusted (using the Macro mode on our digital camera), the rest of the pictures turned out pretty well. Granted they don't have the style and composition that's going to land me in Gourmet anytime soon. So without further ado, we present our very first photo journalistic submission to Gastronomic Fight Club. 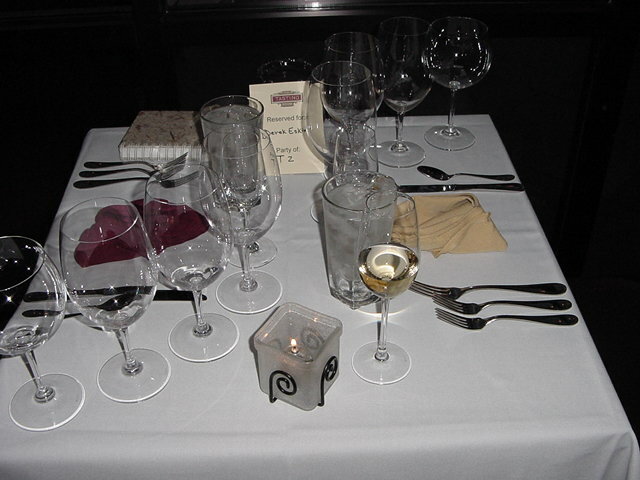 Table setting with 5 wine glasses each. Seared Scallop marinated in Sake with Rubyred Grapefruit Confit, crisp Shallots and Gastrique.